He points me to the door leading inside with a dismissive wave. That’s it? I feel I have just won an unnamed yet crucial battle. Grinning ear-to-ear with relief, I tiptoe past him and enter a huge hall with scores of low beds arranged in neat rows. It is empty save a couple of destitute too near to death to have the energy or will to rise. The rest are all in the dining area, taking a break. Kalighat, the Home of the Pure Heart [Nirmal Hriday]—formerly known as Kalighat Home for the Dying—is a hospice for the sick, destitute and the dying. It was founded by Mother Teresa on her 42nd birthday in 1952, two years after she established Missionaries of Charity in Kolkata, then Calcutta. 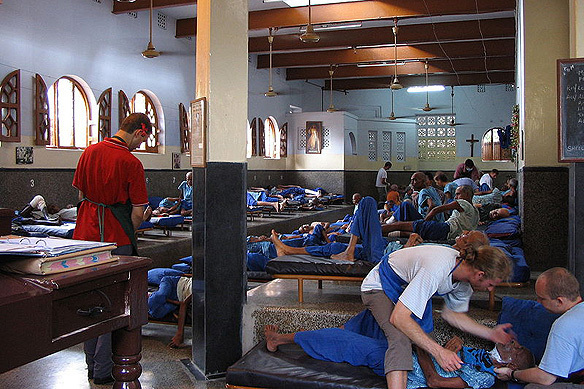 Sister Alix, a resident nun from Kerala, and an unfathomable concoction of cynicism and selflessness leads me in and promptly leaves me amidst around 50 male inmates and a handful of young non-English, non-Hindi speaking registered foreign volunteers washing dishes and cleaning wounds with quiet love. There are trauma patients, lepers, some without arms, some without legs, some paralysed or diseased, and one, once upon a time maggot infected young good looking man, with his left eye now stitched together. In no time I find myself in the grips of a pan-Indian carrom board match with the inmates. Since there is a certain degree of anonymity associated with the patients, we rename ourselves as city teams. Hence, there is Jabalpur versus Indore versus Bhubaneshwar versus Lucknow versus Mumbai, and so forth, all of us piled around the square board. “Who won?” I ask, bewildered, every now and then. “Who cares!” is the answer I get promptly. A legless beggar from Gwalior tells me, his eyes misting over, “Bachpan yaad aa gaya [I am reminded of my childhood.] The others call out in jest, “Rondu” [cry baby] and he breaks into a bashful smile. I don’t remember when I last laughed so much nor had such a super chilled out time. There were hoots of joy, loud guffaws, and little jigs danced every time a score was made, punctuated by intense focused strikes. The rules were all broken, each one of us playing so that we could win, and if the scattered disks did not allow for it, then so the next could. Gathered together in the heart of Mother Teresa’s City of Joy with her poorest of poor, I felt I was with a bunch of buddies. Not for a moment did I feel sorry for any one of them, and that is the honest truth. They did not see themselves as victims, and because they did not, I did not. That’s how simple the universe works. Nirmal Hriday is the first Missionaries of Charity home set up by Mother Teresa, and often referred to as her first love. Dedicated to take care of the most destitute in the city with medical and emotional care, inmates suffer from AIDS, leprosy, malnutrition, cancer or unidentified illnesses. Despite the name, an estimated 70 percent get well and go back home. I give Sister Alix a huge bear hug on my way out. My way of saying thank you for the joys the afternoon had given me. I am not a Catholic. I am not even a Christian. For me the experience was just about being human. I also realise the number of regular Indians as volunteers in these homes is close to zilch. Photo credits from top–Omar C. Garcia, Mark Makowiecki. Note: The above post forms part of my blog’s Giving Back series which explores giving back initiatives in India. 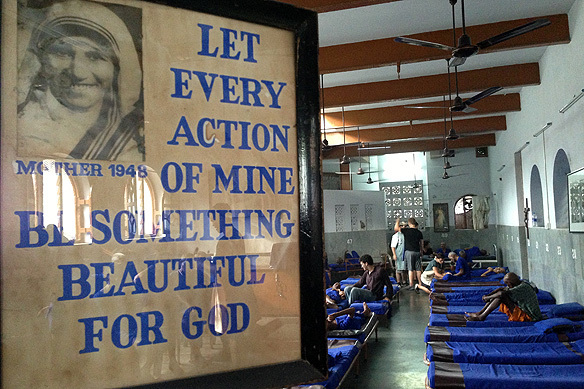 This entry was posted in Exploring India, Giving Back, Personal Musings, West Bengal and tagged Kalighat Home for the Dying, Missionaries of Charity, Mother Teresa, Nirmal Hriday, Volunteering in Kolkata by Rama Arya. Bookmark the permalink.